Straddling the Danube in the city of Bratislava, Most SNP (short for Most Slovenského národného povstania, which is in turn translated to "Bridge of the Slovak National Uprising") is meant to honor a tumultuous time in Slovakian history, but is better known for the saucer-shaped restaurant atop its single, asymmetrical pylon. Completed in 1972, this cable-supported bridge is the longest single-pylon suspension bridge in the world, and has likely undergone more name changes than any other bridge as well. 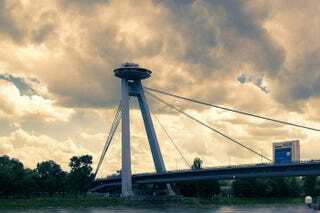 Originally christened, the "Most SNP" in honor of a 1944 resistance movement against Nazi forces, the bridge was soon known almost universally as the "UFO bridge" due to the circular restaurant that was built atop its single set of pylons. Recognizing the overall dismissal of the bridge's original name, the city changed the name to "Novy Most," or "New Bridge" in order to incorporate popular sentiment. Unsurprisingly, many citizens were not pleased with this change and voted to change the name of the bridge back to, "Most SNP" in 2012. Despite the near constant name-changing, the Most SNP and its UFO Restaurant (the eatery's official name now) still draw visitors from all over the world interested in the unique engineering as much as the scenic view.